Place the ingredients evenly into the Acquablend basket. Fill the Acquablend bottle with water. Leave to infuse at room temperature or chill in fridge for over an hour or leave overnight for a fuller infusion. Stay up to date with new products, offers, recipes and articles. 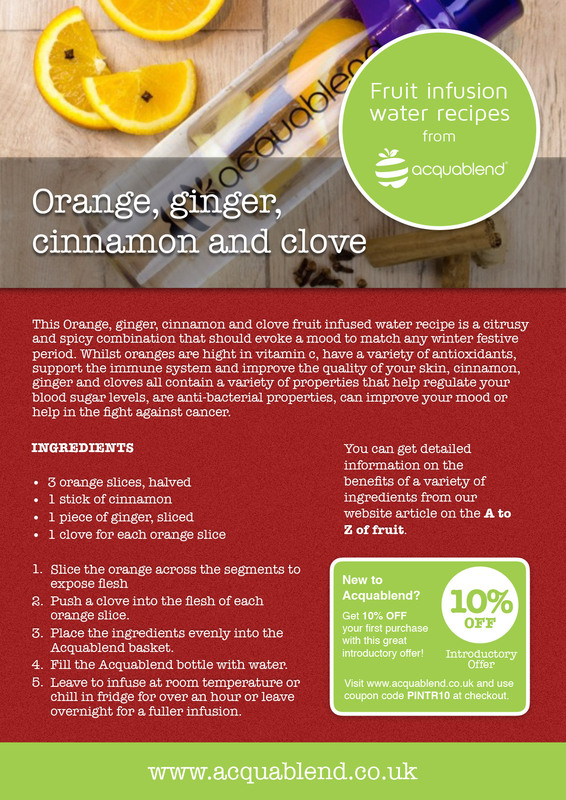 This Orange, ginger, cinnamon and clove fruit infused water recipe is a citrusy and spicy combination that should evoke a mood to match any winter festive period. Whilst oranges are hight in vitamin c, have a variety of antioxidants, support the immune system and improve the quality of your skin, cinnamon, ginger and cloves all contain a variety of properties that help regulate your blood sugar levels, are anti-bacterial properties, can improve your mood or help in the fight against cancer.